The three women fighter pilots were formally commissioned into the Indian Air Force (IAF) by Defence Minister Manohar Parrikar. 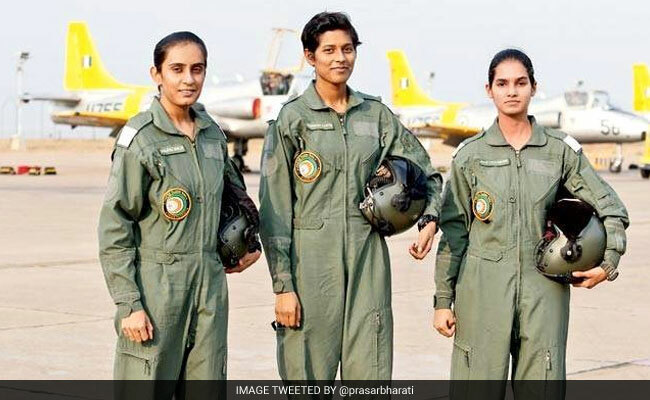 Hyderabad: Flying Officers Avani Chaturvedi, Bhawana Kanth and Mohana Singh on Saturday were commissioned as India's first three women fighter pilots. On completion of successful training at the Air Force Academy in Dundigal on the outskirts of Hyderabad, the trio were formally commissioned into the Indian Air Force (IAF) by Defence Minister Manohar Parrikar and were the centre of attraction at the Combined Graduation Parade. The women, who broke the barriers to etch their names in the history of the IAF, will get to fly fighter jets next year after completion of stage-III training at Bidar in Karnataka. The women, who flew the Pilatus and Kiran jet trainers, will now get to train on the Hawk advanced trainer jets for a year before being allowed to fly supersonic warplanes. They were all elated and excited after the defence minister conferred on them the 'President's Commission' to formally induct them into the IAF. Talking to reporters, they said it was a great honour to be in the first batch of women fighter pilots. "We are happy to get this opportunity to serve the country," said Ms Chaturvedi. They said they enjoyed the six-month training at the academy and never felt that they were being treated differently for being women. Asked what role they expect to play in the force, they said they will now focus on the next level of training. Ms Chaturvedi, hailing from Satna district in Madhya Pradesh, comes from a family of army officers. She was inspired by her brother who is also in the army. Bhawana Kanth hails from Darbhanga district in Bihar. As a child, she always dreamt of flying planes. She opted for the fighter stream after successfully completing her stage I training. Mohana Singh comes from Jhunjhunu district of Rajasthan. Her grandfather was a flight gunner in Aviation Research Centre and father is a warrant officer in the IAF. Ms Mohana is excited to continue the family legacy of serving the nation. While women pilots have been flying helicopters and transport aircraft since 1991 in the IAF, it was last year when the government decided to allow women into fighter jet cockpits. In February this year, President Pranab Mukherjee had announced that women cadets will be allowed in combat roles in all three services. Speaking at the parade, Mr Parrikar said more women would join the armed forces. The minister reviewed the colourful passing-out parade and conferred the 'President's Commission', on behalf of the President of India, on 129 graduating trainees of various branches, including 22 women trainees. Mr Parrikar also presented the 'Wings and Brevets' to the newly commissioned officers of the flying branch and to officers from the Indian Navy and the Coast Guard.